Our blog post today comes from History of the Book student and CRC volunteer Allie Newman. 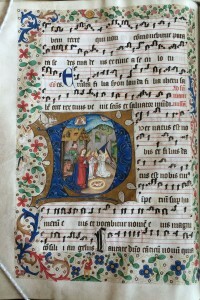 The University of Edinburgh’s Centre for Research Collections (CRC) is home to over 300 examples of Western medieval manuscripts, ranging from single leaves and fragments to large bound tomes. While it can certainly be said that this collection represents some of the oldest material in the library, it cannot be said that everything in the collection has been exhaustively examined, even given the items’ relatively long existences. Despite the great age of the items, they are still producing new discoveries in terms of textual content and physical structure, both of which inform our understanding of their individual histories and book history as a whole. I recently made a very interesting, if very tiny, discovery that could hopefully shed some more light on the medieval scribal and artistic processes. 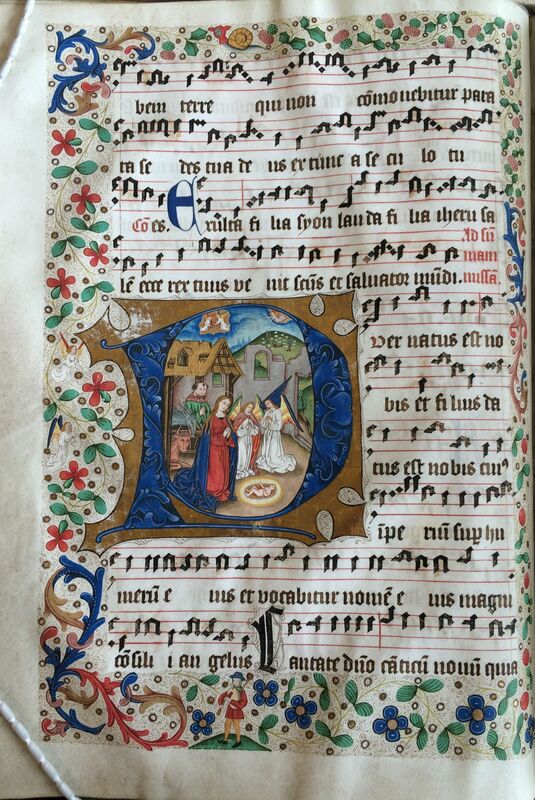 MS 33, a 15th century illuminated Dutch gradual (or songbook), is a large and somewhat unwieldy volume, and is known as the source of the illuminated piper that graces the logo of the Friends of Edinburgh University Library. 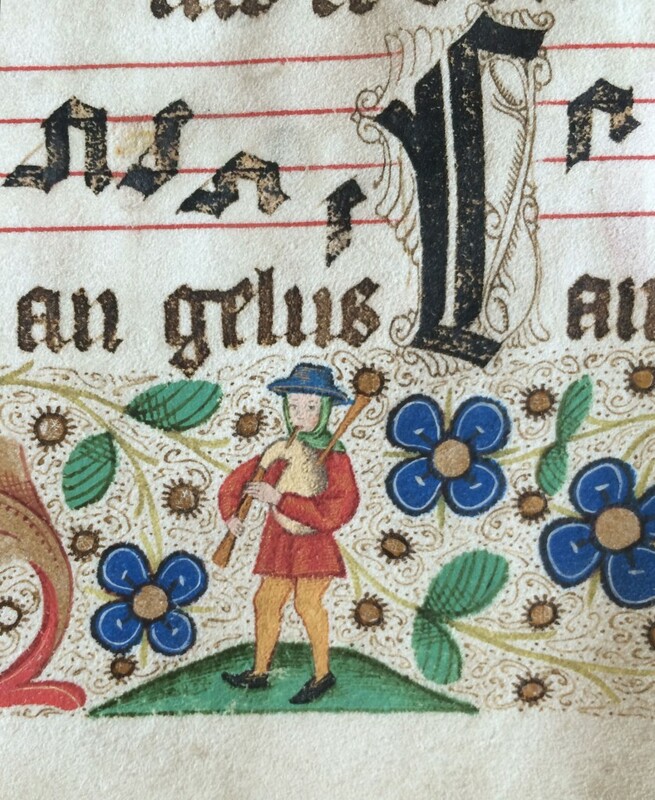 The piper is actually part of a richly decorated floral border that surrounds a page of music, further embellished by a large illuminated initial (folio 10 verso). Because of the Friends’ desire to use the piper in its marketing material, not only has this particular page of the manuscript been digitized, the piper himself got a high-quality close-up. This close-up, along with a number of other pictures of different leaves from MS 33, was uploaded to the CRC’s digital image gallery. As a volunteer in the digital imaging lab in the CRC, I write metadata for the images in this gallery- the piper and I crossed paths as I examined his image in order to come up with key words to describe him. Do you spy anything out of the ordinary yet? I certainly didn’t, until, on a whim, I decided to view the image in the highest detail possible. Scrolling my way across the image, I came across something that did not belong: a very small fragment of a feather. Even in this high-quality image, it is somewhat difficult to pick out, but it can be seen emerging from the edge of the piper’s pipe and onto his shoulder. 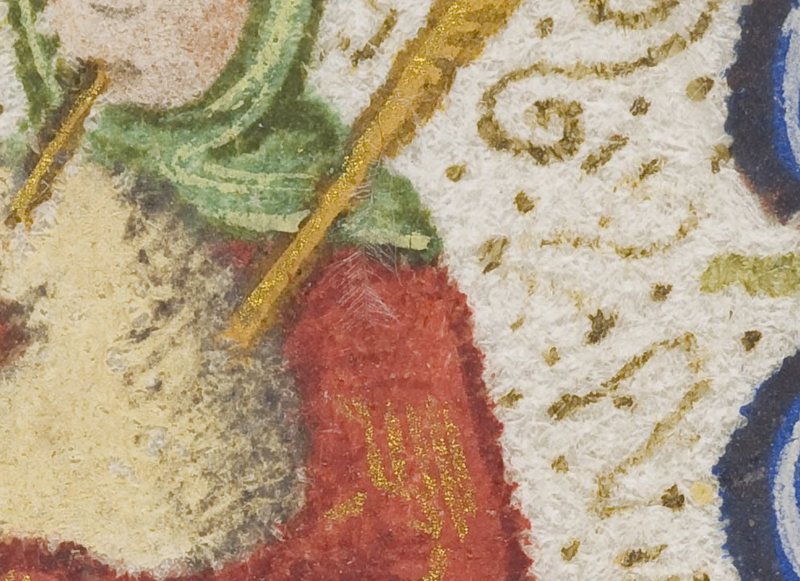 While the presence of the feather in this image could’ve just indicated that it came into the frame as a bit of free-floating dust, an examination of the manuscript in person proves that this is not so: not only is the feather still present on the page, it appears to be semi-embedded in the paint of the illustration. There are several theories on how the feather came to be part of the illustration. The most interesting explanation is that, during the writing and illumination process, a stray feather from a scribe’s quill somehow floated into some wet paint, to be forever kept in place as part of the figure. While this may seem unlikely, it is a possibility, as both scribes and illuminators sharpened their own quills, often cutting off the fluffy parts of the feather in order to give a more even grip for careful work. Another explanation is that, in some point in the manuscript’s life, a combination of things happened: it was opened for a prolonged period of time in a somewhat moist environment, softening the paint, while fibres, including our feather, floated through the air and settled on the page. The book was then closed for a long period of time, melding the feather to the paint. However, the lack of paint transfer onto the recto of the following page casts some doubt on this theory too. Either way, the feather presents somewhat of a conservation conundrum. Even if it is a medieval feather, worthy of further investigation and study, the fact is that it remains very slightly mobile on the page. As only the extreme end of it remains bound to the paint, a stray breath makes it wiggle about, and the fear is that it may one day be blown away, along with whatever portion of the paint is holding it in place. Further study is required in order to truly draw any conclusions about the nature of the feather, including examining the page under a microscope to try to deduce how much of the feather is truly embedded in the paint. However, if it does prove to be a feather from a medieval bird, it opens doors for all sorts of information to be learned, such as what kind of a bird it came from and what place the feather had in the process of producing the manuscript. However the future study of it progresses, the discovery of the feather is a wonderful illustration of how new things can still be discovered about old books. This entry was posted in 15th Century, Collections, Music, Rare Books and tagged Dutch, manuscript, Medieval, music, rare books by fbaseby. Bookmark the permalink. Great post Allie. Now that you have located this we should re-photograph that area with the extension tubes on the Hasselblad lens and get sharper detail and richer information. Very significant as the Friends of University library has this Piper as their logo!